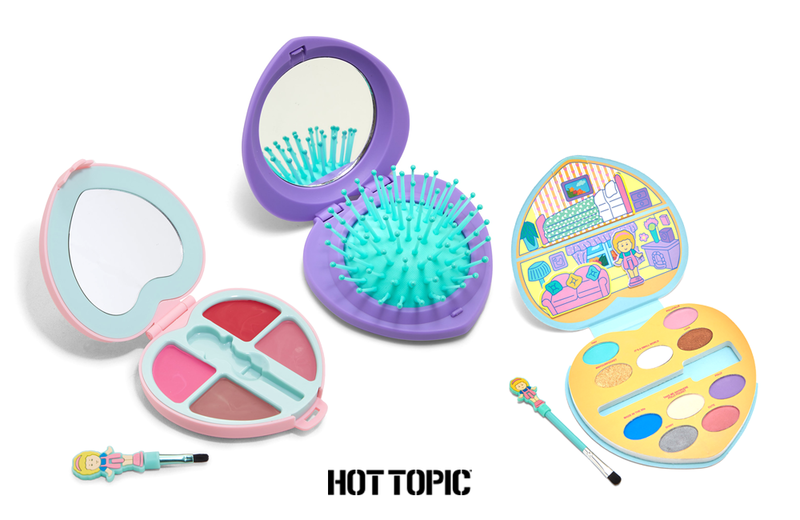 In honour of the iconic toy line’s 30th anniversary, Mattel has collaborated with Hot Topic to release an official Polly Pocket-inspired makeup and accessories line. Designed in a nostalgic ‘90s colour palette, the toys are shaped like, and open like, the original Polly Pocket cases. The Lip Palette is 4-inches x 4-inches, with a Polly lip brush topper and four matte lipstick shades. The 6 ½-inch x 6-inch Eyeshadow Palette includes ten shades in a mix of matte and shimmer finishes, and a brush with a removable silicone topper shaped like Polly. Fans of the line will appreciate the backdrop of 3D furniture with Polly standing front-and-center when the case is opened. In addition to makeup, Hot Topic has also released a compact pop-up brush. The 2¾-inch x 3-inch compact includes Polly branding, a mirror, and a fold-out brush with turquoise bristles. Hot Topic’s entire Polly Pocket collection is available on its website. The makeup collection items start at $9.90 USD. To celebrate the iconic sci-fi franchise’s 50th anniversary, Andrews McMeel Publishing has released the Star Trek 50 Artists. 50 years. 2017 Poster Calendar. Classic toys meet stamp collecting with the release of the Royal Mail’s Classic Toys commemorative collection of stamps featuring iconic UK toys from the past 100 years.